In 2009 Whole Systems board member, Norton Smith, helped to outfit and prepare the tall ship, Brigantine Kaisei, for a voyage into the Eastern North Pacific Subtropical Gyre. 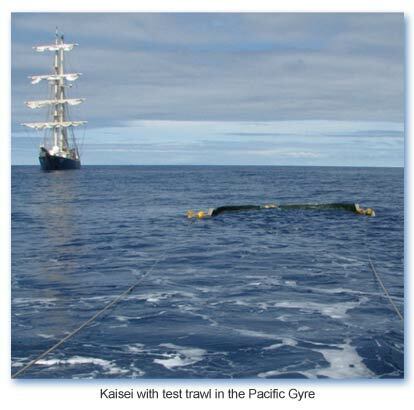 In August the ship owned by Ocean Voyages Institute and funded by Project Kaisei, departed for the North Pacific Gyre. Norton Smith and another board member, Melanie Smith, were on board for the 28 day voyage to observe, document, and collect samples of ocean plastics. Norton, constructed prototypes of several devises to collect the debris floating in the gyre. The science team onboard the Kaisei did one hour trawls two times a day starting 400 miles off the coast of California. As the sample data accumulated it became shockingly apparent that plastic marine debris in the Oceans is an enormous and overwhelming problem. Long before we were supposed to arrive at the Gyre, where the plastic is accumulating, we were finding large qualities of small plastic particles in our trawls. These particles resemble planktonic organisms, and are mistaken for food by the small oceanic creatures in the food chain. We observed jelly fish crabs and lantern fish ingesting these plastic particles. It is known that ocean plastic acts as a sponge for Persistent Organic Pollutants (POP’s) which are ubiquitous in our oceans as a result of human activity. The plastic pieces collect and concentrate these POPs on their surface which then transfer to the ocean life that ingests the plastic. These POPs concentrate up the food chain to the fish we eat and into higher marine organisms. Recent studies have uncovered the alarming level of PCBs in whales both in Puget Sound and the high arctic. Whole Systems has begun our own project called Plastic Planet to study and change the way we use and discard plastic in our lives. To greater understand how the plastic gets into the Ocean, Norton Smith has embarked on a study of trash and debris management issues in the Caribbean. Since December 2009 he has visited 19 islands traveling by sailboat, interviewing waste management officials and observing refuse disposal practices at each location. The Caribbean project is intended to assist the various island governments in establishing a long term solution to waste disposal and pollution in the area. See Norton’s article on Caribbean Plastics. Upon the return of the ship in September, Melanie Smith, continued to work with Project Kaisei researching the marine debris issue, talking to plastics industry representatives, and assisting Project Kaisei prepare for another series of voyages in 2010. Her work has confirmed that plastic is an issue that need to be addressed on many levels. The toxicity of plastic and its POP content and the effects of these toxins on humans and the environment need to be acknowledged by manufacturers and government. The development of “safe” plastics made from low carbon footprint sources is another issue she is working on. She is also starting a campaign for the City of Ashland Oregon to eliminate plastic shopping bags and plastic to-go containers.